GLEN ARM, Md., Oct. 5, 2010 — It isn't every day, is it? It isn't every day you get to listen to Dr. Charles Townes — inventor of the maser, precursor to the laser, without whom the world would likely look very different today — as he recounts his journey of discovery and reflects upon the virtues of determination and doggedness. I was sitting in the events room of Lenox Laser, tucked away in this picturesque corner of Maryland, and Townes, 95, was telling the story of the morning in 1951 he first realized he could create a maser. He had been working with a committee of scientists and engineers trying to find a way to produce shorter waves and had gone to the nation's capital to report on the work. "It was our last meeting in DC," he said, "and we still had no new ideas." He woke up early that morning and, not wanting to disturb the colleague with whom he was sharing a room, went to the park to puzzle over the problem one last time. There, as he sat amidst the azaleas and the sunshine, inspiration struck. He pulled a piece of paper from his pocket, he said, and started scribbling equations. Townes decided not to mention the possible solution in the meeting later that day - he'd barely had time to write it down, much less to figure out how he might make it work — but immediately set to work upon returning to Columbia University, where he held a faculty position. Other investigators weren't exactly brimming with confidence. After our man had devoted some considerable time and resources to the new idea, a pair of colleagues came by his office and said to him, "'You have to stop. You're wasting the department's money.'" He brushed off their protestations. "Fortunately, I was an associate professor and they couldn't fire me," he explained. "He just wouldn't talk to me about it anymore," Townes said. 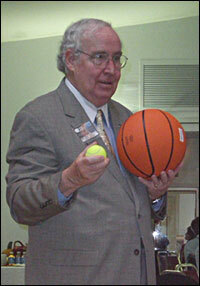 Dr. John Wood of NASA demonstrates an important principle in astrophysics. 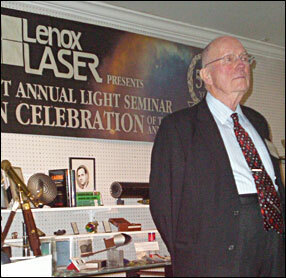 The event, the 1st Annual Light Seminar hosted by Lenox Laser, also featured a fascinating talk by Dr. John Wood of NASA and contributions from a variety of others. Part seminar, part family picnic and part tent revival meeting — and I mean that as a high compliment — it brought together a range of people interested in light and offered a fun, vibrant environment in which to share their ideas. None of this would have been possible without Lenox Laser president Joseph d'Entremont, whose warmth and enthusiasm are both palpable and infectious. "We will never forget this day," he told me over chicken cacciatore and chocolate cake, his smile as broad as broad can be. d'Entremont also revealed a passion for education as he discussed the other reason for gathering everyone together: the creation of a light museum, initially featuring his own extensive collection of optical instruments and other artifacts as well as those of colleagues. He spoke at length about the idea, and welcomes any input others might have. From Masers to Lasers in Space — and at the Cinema! An acronym for microwave amplification by stimulated emission of radiation. Predecessor to the laser, the maser or 'microwave laser' was the first device to produce coherent electromagnetic waves, and was done at microwave frequencies through amplification by stimulated emission. A laser (light amplification by stimulated emission of radiation) is a maser that works over a broader range of higher frequency photons in the ultraviolet and visible portion of the electromagnetic spectrum.